Hitting the playground with your preschooler? It's a great way for your little one to have fun, sure, but with every jump, slide, and seesaw they are exercising and working on important gross motor skills. In particular, the swings are a great way for a child to practice their coordination as well as hone the large muscles in their arms and legs‐not by being pushed, of course, but by learning how to pump themselves. Pumping on a swing may seem simple enough, but it's actually a pretty complicated maneuver. a few things need to happen before a child can learn to do it. First, make sure your child is OK on a big-kid swing, rather than riding high in a bucket-type one. (Bucket-type swings are a lot harder for a child to self-pump on.) Your preschooler will need to have some balance and promise to always hold on tight to the ropes or chains while sitting in the seat. (Reinforce that a few times.) It will take a few sessions of playground playing before she might feel comfortable with this new sensation of sitting on a non-bucket-type swing. There really isn't much support on a typical playground swing that doesn't have a back or front, so don't rush your child. Give her a chance to get used to it and feel like she's ready to take the next step. Once you think she's ready, explain how she's going to be in charge of making the swing go, instead of your pushes. (Preschoolers love being in charge, so this is a good way to phrase it, especially if your child seems reluctant to do start pumping the swing herself.) To start, get on a swing yourself. Let her watch you swing and pump. As you go, give some play-by-play of what you are doing. "Legs back, legs out." Try to find a low-hanging swing so it's easy for your child to get on and off alone. If you feel comfortable, bring your child into your lap while you pump your legs and swing so she can get a feel for how the motion is supposed to go. Stand in front of the swing and hold out your hands. Have your child attempt to touch your hands with her feet as she swings. Teach her to "kick the sky" as she moves forward and "be a turtle" (hide and tuck her legs) as she moves back. Part of learning how to pump on a swing is to remember when to do which motion during the process. By simply saying each movement as she is supposed to do it (even just "forward" and "back"), the message will begin to register. 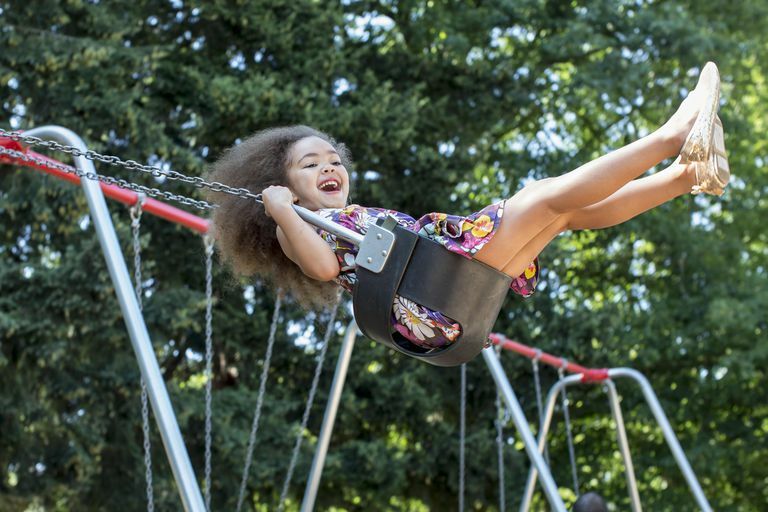 Remind your child that when they are walking near a swing set or playground, they need to be very aware of other people swinging on swings or they could get hurt. Teach him not to walk directly in front of or behind someone swinging. How Can You Get Your Children to Listen to You?